2nd place, Cottage Fleece. 2016 National Alpaca Fleece Show. Look at Veva’s pedigree and you notice two things. First, she has some amazing ancestors but not the same ones being used over, and over and over. Outcross genetics here. we thought a long, long time about who to select for Veva’s maiden breeding. We’re excited to see the results after choosing the black fleece champion Amazon’s Nighthawk for a 2016 cria. Viva Bell is a bashful girl. Viva attended one show, bringing home a third place ribbon but was not a fan of the commotion. She is a sweet girl but prefers to be at the back of the pack and surrounded by the safety of friendly alpacas. Unless it is time for food. Then Viva is all business and most certainly makes her presence known. The density on this girl is AMAZING and we cannot wait to weigh her 2015 fleece! Her beautiful buttery fleece came in at over 7 pounds of firsts and seconds and nearly 3 pounds of skirted blanket. This is one fleece that we will be setting aside for our own uses or for a special spinner who will make some lovely items. We couldn’t wait for shearing and snipped a sample from her side in late February for testing. 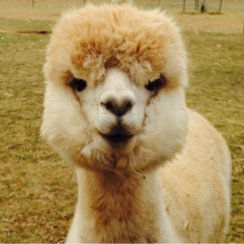 Results at shearing reveal a 24 micron fleece and we, admittedly, were a little overzealous on the feed as new alpaca owners. The photos are attached and really do not do it justice. Her conformation is perfect. Veva has a boxy frame with a deep, wide chest. Correct feet and legs which promise she’ll be prepared for a long and healthy productive life. Her pedigree contains a mix of colors and, as mentioned earlier, we are told she has a high likelihood of producing grey. Desert Son is on the top and bottom of the pedigree and look at his award history!